MILLEDGE L. BONHAM. 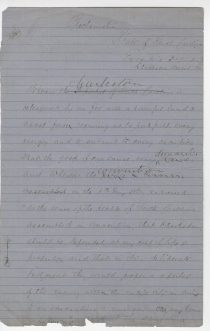 Manuscript Document Signed, Charleston, South Carolina, August 17, 1863. 4 pp. on lined blue paper, watermarked F A Gordon 1862, 8 x 12½ in. The siege of Charleston, South Carolina, lasted through the latter half of the Civil War. After the U.S. Army surrendered Fort Sumter in April 1861, Confederate forces occupied it and several additional fortifications to protect Charleston harbor. The South Atlantic Blockading Squadron attempted to intercept any ships going into or coming out of the harbor. 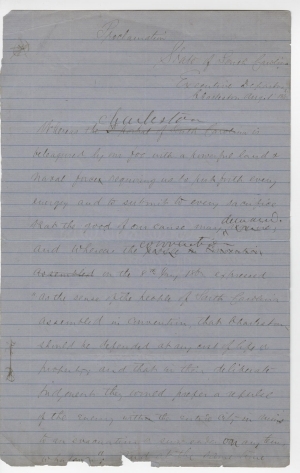 In January 1863, a state convention determined that Charleston should be defended at all costs. In April 1863, nine Union naval ironclads attempted to destroy the Confederate forts defending the harbor but failed to penetrate even the first line of defensive works. Union forces did, however, occupy Folly Island. When Union forces returned in earnest in July 1863, the Confederate general in command of Charleston advised the evacuation of all non-combatants, but few heeded his advice. 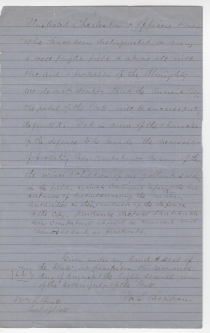 In this proclamation the following month, Governor Bonham added his urgent plea that citizens and their “human property” leave the city to prevent civilian deaths and to free the Confederate military forces to defend the city without distraction. From July to September 1863, Union army and navy forces attacked the Confederate forts on the barrier islands. Two infantry assaults on Fort Wagner on Morris Island failed, the second made famous by the movie Glory, but a subsequent siege of the fort forced the Confederates to evacuate it in early September. By August Union forces on Morris Island were able to construct a battery with the ability to bomb Charleston directly. On the date Governor Bonham issued this proclamation—August 17—the battery received its armament, a 200-pound Parrott rifled cannon referred to as the “Swamp Angel.” After an ultimatum went unanswered, Union artillerists opened fire on August 22. Confederate defenders demanded an additional opportunity to evacuate non-combatants, and the Union commander gave them twenty-four hours. He resumed fire, but the Swamp Angel burst on its 36th shot. Though initially causing little damage, the bombardment of Charleston continued intermittently for 587 days and destroyed much of the city that had survived the December 1861 fire. Meanwhile, Union artillery also opened fire on Fort Sumter on August 17 and fired nearly 1,000 shells during the first day. By August 23, the masonry fort had been reduced to rubble, though intermittent bombardment continued until December 1863. The Union commander deemed it “a shapeless and harmless mass of ruin,” though Fort Sumter and the City of Charleston remained in Confederate hands until General William T. Sherman’s army marched through South Carolina in early 1865. Mayor Charles Macbeth surrendered the city on February 18. Now, therefore, I, Milledge L. Bonham Commander-in-chief in & over the State of South Carolina do recommend to, and enjoin upon, all good citizens the removal from Charleston, as early as practicable, of all non-combatants & upon the said Commission the propriety of exercising, if necessary, in their judgment, the powers conferred upon them by the Convention for the furtherance of the above object. With a Comdg General whose skill & valor have <4> illustrated Charleston & Officers & men who have been distinguished on many a well fought field & above all with the aid & protection of the Almighty we do not doubt, that the Ancient City, the portal of the State, will be successfully defended. Yet in view of the character of the defence to be made the necessity of protecting non-combatants, many of them the wives & children of our gallant soldiers in the field, against contingent injury, & the importance of disembarrassing the military authorities in their conduct of the defence of the city, prudence dictates that such non-combatants should be removed and removed as early as practicable. Given under my hand & seal of the State, at Charleston, this seventeenth day of August & the eighty seventh year of the sovereignty of the State. Milledge L. Bonham (1813-1890) graduated from South Carolina College in 1834. After serving in the Seminole War in 1836, he studied law and was admitted to the bar in 1837. He commanded a regiment in the Mexican War and served as major general of the South Carolina Militia after his return. He served in the state legislature from 1840 to 1843 and then in the U.S. House of Representatives from 1857 until he resigned in December 1860. Bonham replaced his cousin Preston Brooks, who had viciously caned Massachusetts Senator Charles Sumner on the floor of the Senate in May 1856. Although Brooks had resigned, South Carolina voters reelected him, but he died a few weeks before the start of the next Congressional term. In February 1861, Governor Francis W. Pickens placed Bonham in command of the Army of South Carolina, and he also served in the Confederate Army in 1861. Bonham joined the Confederate Congress in January 1862, and served there until the South Carolina General Assembly elected him governor in December 1862. He served as governor until December 1864, when he rejoined the Confederate Army. Page one with ragged edge and slight loss affecting bottom line. Scattered toning, lightly penned but entirely legible. 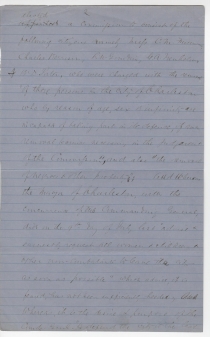 Full text of the Report and Resolutions, January 8, 1862. Mayor’s Office, Charleston, July 9, 1863, 1:30 p.m. Whereas, the enemy, by land and sea, have appeared in large force on the Islands in the neighborhood of the city, and in consultation with General Beauregard, he expresses the opinion that an attack on our city is imminent, I, with the concurrence of General Beauregard, advice, and earnestly request, ALL WOMEN AND CHILDREN, AND OTHER NON-COMBATANTS, to leave the city as soon as possible. Charleston Mercury (SC), July 10, 1863, 2:1. 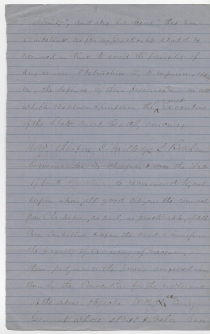 Full text of Pierre G. T. Beauregard to Milledge L. Bonham, August 15, 1863. William R. Huntt (1833-1869) was elected Secretary of State of South Carolina by the General Assembly in December 1862 and served until 1866.